Remember that moment when you finished your main meal at pizza hut, only to glimpse at the dessert menu and see the cookie dough calling your name. I mean hot cookie dough topped with melting vanilla ice cream, who could turn that down? Now you can re-live that moment on the comfort of your own sofa, wearing your comfy trousers and enjoying a bit of TV! In a large mixing bowl, combine and mix together the light brown sugar and all of the butter. Mix until the butter is nicely broken up. Add the flour to the mixture and continue to stir, then pour in the vanilla extract. Continue stirring until you get a nice smooth consistency. Finally add a pinch of salt and all of the chocolate chips and stir until well mixed. 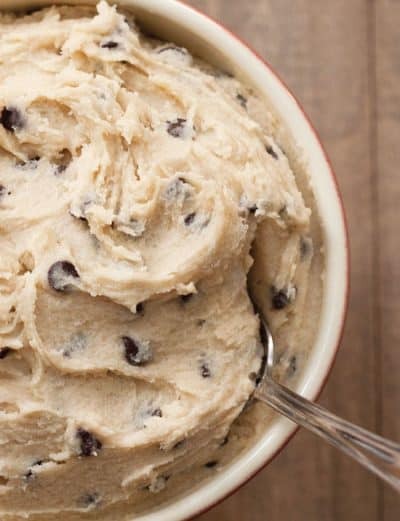 Add in 2-4 tablespoons of water until you get a soft cookie dough consistency. Divide the mixture into 4 small dishes and bake for 8 minutes. After 8 minutes, turn the temperature down to 180°C and continue to bake until light brown. Around 5 minutes. Serve immediately with a scoop of vanilla ice cream and a drizzle of chocolate sauce for good measure!